Cool. I've never seen a turtle in the wild. There are not many of them sunning themselves on the LA freeways. Hey Pete did you happen to notice if it had an unusually long tail??? It sort of looks like a snapper. -->> Joe may be be right. Look at the eyes too. A couple years ago my dad had a hilarious encounter with a snapper. It was underneath his car and he decided to try and get it out with a big stick. Needless to say the turtle ended up snapping the stick in half, which was quite a feat. Come to think of it, my dad has a lot of encounters with snappers. We were out golfing this past year and he ended up confronting another snapper that was blocking our path. I'm starting to think my Dad is like the Shredder or something. LOL. Someone visit my blog! Kthxbye! She does look like a common snapper with that face. They have a smoother carapace than the Alligator Snappers. 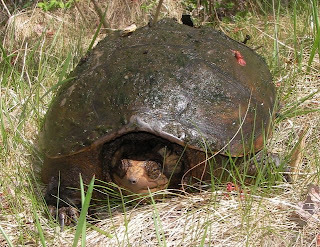 The limbs look chunky and there's a lot of neck around the head, so yea common snapper and I'm gonna assume a nesting female cos Snappers don't usually come out to bask like sliders, cooters ,etc.